David Macaulay Studio, 9781596438743, 48pp. Up close with the ocean's most fearsome and famous predator and the scientists who study them-just twenty-six miles from the Golden Gate Bridge! A few miles from San Francisco lives a population of the ocean's largest and most famous predators. Each fall, while the city's inhabitants dine on steaks, salads, and sandwiches, the great white sharks return to California's Farallon Islands to dine on their favorite meal: the seals that live on the island's rocky coasts. Massive, fast, and perfectly adapted to hunting after 11 million years of evolution, the great whites are among the planet's most fearsome, fascinating, and least understood animals. In the fall of 2012, Katherine Roy visited the Farallons with the scientists who study the islands' shark population. She witnessed seal attacks, observed sharks being tagged in the wild, and got an up close look at the dramatic Farallons-a wildlife refuge that is strictly off-limits to all but the scientists who work there. 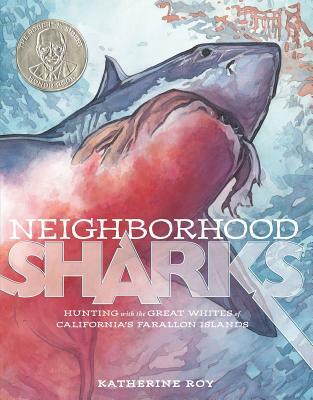 Neighborhood Sharks is an intimate portrait of the life cycle, biology, and habitat of the great white shark, based on the latest research and an up-close visit with these amazing animals.